Following from Jonathan Allen's recent post on illustrating picture books for educational /school publishers and we also had Penny Dolan's great Guest post in August where she talked about her 'early readers' in Ideas and Inspiration or when is a picture book not a picture book I thought it might be an idea to take a look at a different side of writing picture books for the educational market. 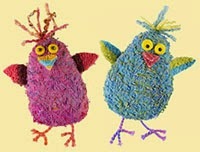 I started my writing career writing books for children who are sometimes called 'reluctant readers'. Those children who find learning to read more difficult than others, for a whole range of different reasons. My very first published books were a series of 8 books for educational publishers Ginn (now part of Pearson Education) who asked me to write one level of a series called ZOOM for children who were around 8-9 years old, but who had a reading age of 5-6 years. There were to be 6 levels in the series ,each level was written by a different author and about different characters. Levels were labelled Sets A to F, and I was to write for set D.
The children would progress gradually through all 8 books on one level, following the characters and their adventures. 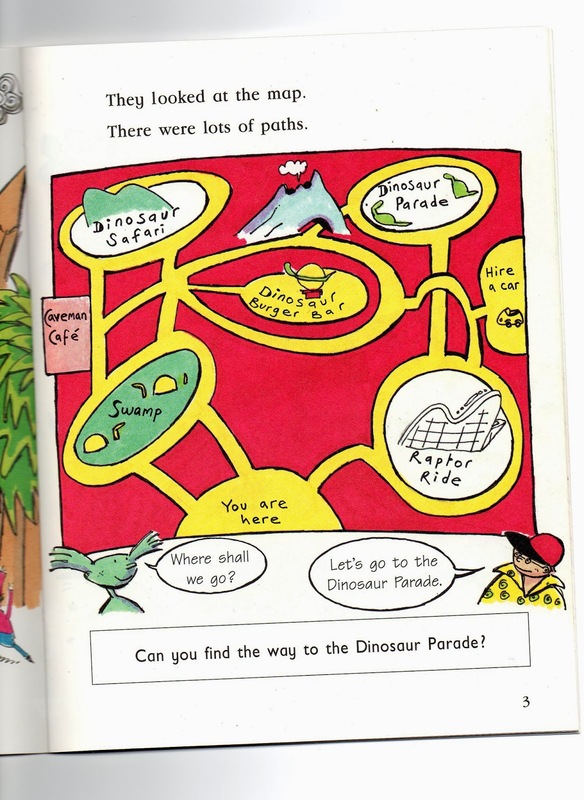 Within each level the books got progressively more challenging so that by the time the child had got to the end of the 8 books they would be ready to move up to the set above and meet new characters and stories that would again be slightly more challenging. My lovely editor for the series was Frances Ridley, and she guided me, a complete novice, through the process. I learned a lot from writing these books and it was a great way to discover how many different ways you can say the same thing, in fewer words and still keep the excitement of the story going. I was given a lot of information about how many pages each book should have, approx number of words on each page etc. etc. but after reading these through I knew that the most important thing was to get two characters the reader would care about. It was more important than ever that the stories would engage the reader because when you find the actual task of reading the words on the page difficult, you need good a reason to read on, and to turn the page. My books were about a boy called Tom and a strange alien girl called Zoola. Zoola is really just a lump of green goo, but she can turn into anything she sees, which provides all sorts of possibilities for adventures. 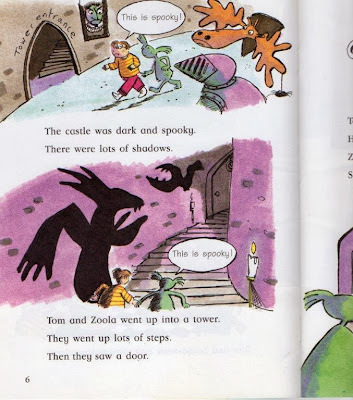 In Zoola and the Ghost they visit a spooky castle and make a startling discovery, the ghost is not quite what it seems. 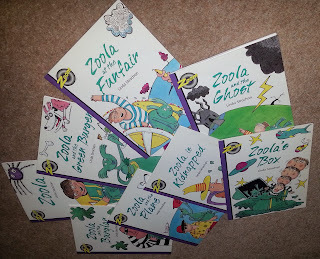 They also visit a funfair and go on a plane, because Tom wins a holiday as a prize for foiling a burglary and catching the burglar, Zoola's help of course! The illustrations, by Julian Mosedale, are really bright and colourful. The text is short and snappy, with very short sentences, lots of repetition and the story layout carefully orchestrated so that you want to turn the page to find out what happens next. 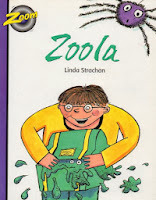 The stories were also designed to lead from one to another as Zoola learns about Tom's world and how some green things are not good to eat (like pond slime and caterpillars) but green apples are fine, as long as you don't steal them from a fruit stall. The prize trip Tom wins is a holiday in the USA so off the go on a plane. As always with Zoola there are several mishaps on board but she does get things right, saving them all in the end. This book is followed by the holiday story Zoola is kidnapped. 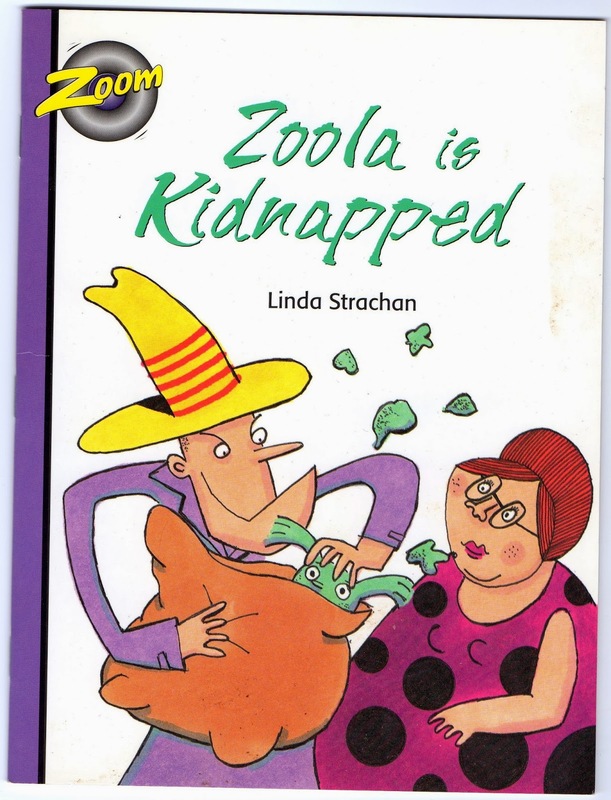 When they visit a dinosaur theme park on holiday Zoola is kidnapped by Shorty and Lofty. I wanted to try something a bit different with this book. So this is a bit of a departure because I wanted it to be a puzzle book. 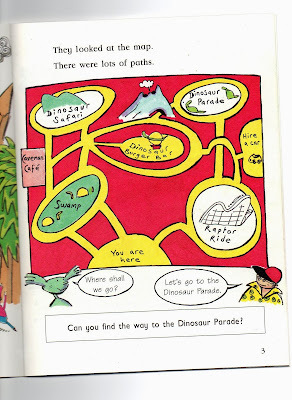 As well as the story-line there are pages where the reader has to guess or spot things in the pictures. Making sure that it is always moving the story forward, these puzzle pages added a bit of a challenge in different ways, sometimes in reading in others observations and sometimes counting. Together Zoola and Tom got into all kinds of trouble but in the end things always turned out okay! I loved writing these stories and the great letters and comments I got about them from teachers parents and young readers themselves. They taught me a lot about writing in general and it is applicable to writing a short story or a novel, just as much as a picture book. -editing to make it as good as it can be. 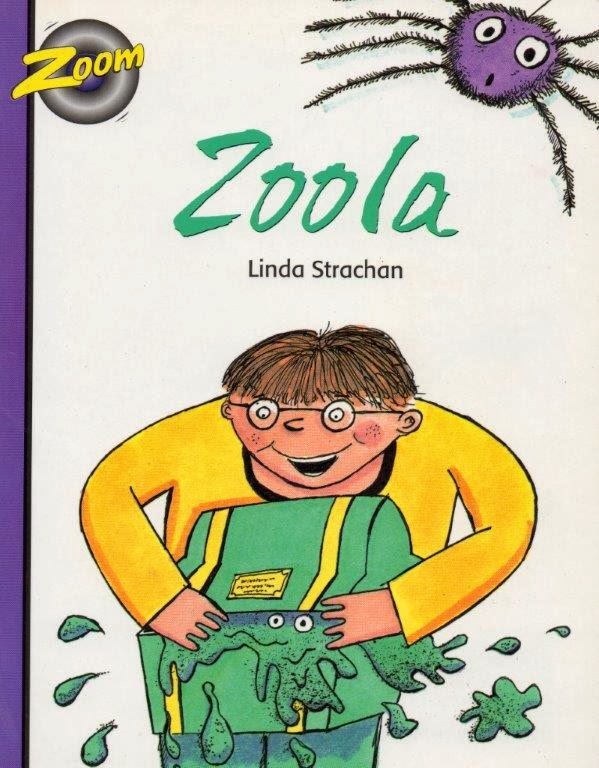 The Zoola and Tom series was also on an audio cassette. The books were originally published in 1997 but now, sadly, they are all out of print. They sound perfect for young readers! I think you should lobby to get them republished! I've just been working on educational readers myself They came with lots of strictures, but I really enjoyed writing them because I felt very close to the young readers I was aiming at. It was as if they were just waiting round the corner for me to finish and hand it over to them. Thanks, Moira. I will might just think about that. I enjoyed writing them, despite all the restrictions! Oh, I know I would have enjoyed learning to read with those books so very much more than I did with 'Tip is a dog. The dog has a ball. The ball is red. Tip has a red ball', etc etc. What a shame they're now out of print! Thanks, Pippa. Learning to read should be fun, not a chore! 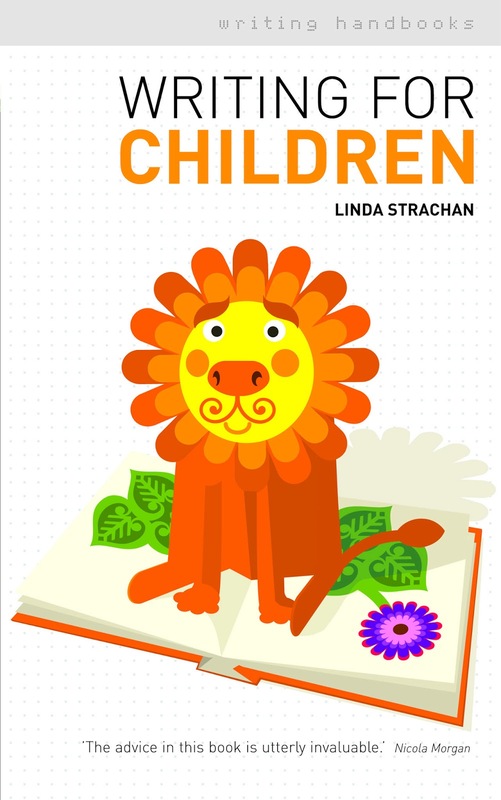 Linda, As the mother of a reluctant reader I can attest that there is great need for good books for this reading crowd. Too bad your lovely sounding series is out of print. I will nonetheless see if I can find them through inter-library loan. Hi Laura. 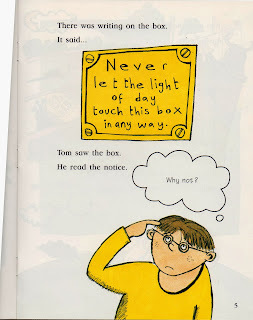 I agree reluctant readers need lots of good books that make them desperate to find out what happens next, keen to turn the page and generally makes the whole idea of reading fun rather than a chore. Have you come across the Barrington Stoke books? Do look them up for all ages of reluctant readers. Great books by excellent writers! I am the chap who drew the pictures for your stories. It was along time ago and one of the first publishing commissions I was was asked to do. I'd quite forgotten about some of these illustrations but how nice to see you still talking kindly about them. I am still illustrating and a a quick trawl through the internet will dig up my website and examples of more recent work should you be interested to see how my style has changed over the years. I'm currently splitting my drawing work with teaching primary school children so the wheel has turned full circle. I'm sure I've got a set of these books in the attic somewhere. Maybe I'll dig them out and pass them on to the school! Very best wishes, Julian. I used to love reading these books when I was a kid. Say do you welcome fanart?